I know those pre-rolled crusts are super popular. I have friends and family who use them and think they're great. Many of us, here, just make our own crusts from scratch. 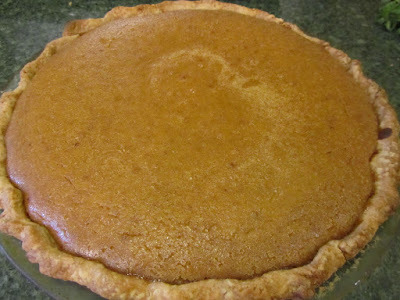 If you don't make your own pie pastry because you've never had success with a scratch crust, try this recipe. It's never gone wrong for me. The huge bonuses with this crust is it freezes well (either in a tin or as a patty of dough), and the recipe makes 5 crusts-worth of pastry. This makes a thin pie crust. If you prefer a thicker crust, or your pie pan is very large side, divide dough into 4 portions, instead of 5. This dough is freezer-friendly. You can make the dough now, while you have time. Then you have the convenience of ready-made pastry, on the holiday itself. In a small bowl (I use the measuring cup from the shortening for this, it saves washing a bowl), beat the egg, water and vinegar together. Add to flour mixture until well moistened. Divide into 5 portions and shape each portion into a flat, round patty. Wrap each in plastic wrap. This dough will keep in the refrigerator for 3-5 days, or you can freeze it for use later. If freezing dough, thaw it for about 1 hour before rolling out. When I freeze patties of dough, I put the wrapped disks of pastry dough in a large ziploc bag. That seems to be "enough" freezer protection for this dough, for a few months. When I have freezer space, I go ahead and roll out the dough and place into pie tins, before freezing. My pie crust is then ready when I am, to put together a quick pie with the convenience of a commercial ready-made crust, but with the cost of homemade. I will often, also, roll out one of the patties into a sheet, and roll up on a cardboard tube from a box of waxed paper, to use this piece of pastry for a top crust. Thaws beautifully, and is easily transferred to the top of a two-crust pie or a meat-based pot pie. This pastry dough can handle extra flour, if needed, for rolling. Extra flour and handling will not toughen the baked product. Ready-made, name-brand pie pastry sells for $2.46 for a two-count package at Wal-Mart. This scratch pastry works out to about $2.50, or less for 5 crusts, or $1 or less for a two-crust portion. That's less than half-price of the name-brand ready-made crust!!! This is the recipe I have used for over 20 years. It is tender and reliable. And I love that I can freeze it to make baking quick and easy. So agree! It's very easy, and as it's name says, "fool-proof". I have only made pie crust the way my mother taught me with flour, salt, and shortening. She must have taught me well, because I've never had a problem. However, I like the idea of using more whole wheat flour and adding an egg to make it lighter. I'm gonna have to remember this recipe. My mother-in-law made great pie crusts, using flour, salt, cold water and shortening. Some people have a knack for it, and do it quite well. unfortunately, I wasn't one of them! Ha ha! But this recipe, with egg, sugar and vinegar added does always turn out well for me. And I'm grateful for that. Adding the whole wheat flour is a bonus. One daughter and I actually prefer the crust with a little whole wheat flour. It gives it a slight "crunch". Thanks Lili, I will share your recipe with my husband since he likes to bake. I don't think I have ever made a crust in my life...and my husband is just starting. We usually forget to plan dessert for our meals and our meals are so basic and simple. I like that the crusts can be made in a large batch and frozen!! A baking husband -- there's an invention I'd like for my house! Having crusts/pastry in the freezer does make the thought of baking a pie seem much more do-able. And on a busy weeknight, I can throw together the ingredients for a meat pie filling, then top with a crust and make a fairly quick pot pie. I'm super excited to give this a try. I too learned the flour, salt shortening recipe from my mother but unlike Live & Learn my results have been hit & miss. With Thanksgiving right around the corner I'll use it for pies and then turkey pot pies. Mine, too! I would think I was following the exact same recipe, but sometimes the crust turned pasty, and other times it was flakey. I couldn't seem to get it right, every time. And I really appreciate being able to make several crusts' worth of dough at a time. It keeps in the freezer for a few months. I have never made pie crust ahead of time for the freezer, but I am definitely going to try your recipe, Lili. It sounds wonderful! I hope you like the results as much as I do. Ready-made pie pastry, tucked away in the freezer, does make pie-baking so much easier. I will give this a try it sounds great . I think I will give freezing it a try too have always made mine as I go . It sure would save time . I also use pie crust for my beef pasties. This would make for a quick dinner . My husband loves pasties and they ate do cheap and filling . I don't do this often, but occasionally make hand-pies, with meat/veggies/gravy and this pie dough, or with fruit filling. I am guessing that would be pretty much the same as pasties. They turn out great! Vodka must also tenderize the dough, like the vinegar. I hadn't heard of the vodka addition, before. That would be a good substitution for someone who doesn't use vinegar in their diet (or someone with a copious supply of cheap vodka!). I, apparently, did not receive the pie pastry gift. But this recipe makes it look like pie-making is easy for me. My Mom was one of those people who always made perfect pie crust. She even won blue ribbons at the fair. My little book with all my special family recipes is packed up. We moved not too long ago and I have not found it yet. I hope I find it soon thank you again it saved the day. :) Pie crust for 2 in the freezer section at Traders Joes Cost $ 3.99 in San Diego. I'm glad this recipe worked well for you! I didn't even think to compare the pie pastry price to Trader Joe's. Yikes! $3.99 just for 2 crusts.